I found the most perfect yarn in the whole wide world! A friend of mine requested that I make a scarf and hat set for his grandmother, and I could choose out the yarn. *_* I'm excited, right? So, we go to Joann's and go yarn shopping. I know EXACTLY what yarn I wanted to make it with, just because I get to handle it. He chooses Some yarn that he likes and finally, he allows me to show him my favorite yarn in that entire isle. It was rather expensive, but he fell in love. I am so happy!!!!!! I know I haven't posted in a while, but I have been very busy making, making, making. I am on a mission to make everyone on my Christmas list a cute hat by Christmas time and so far I have been doing a very good job. I have made one HUGE accomplishment today and I am so excited about that this post will be mostly about it. I am not such a big fan of knitting but I have been going through Ravelry and some of the really cute hats were knitted so I broke down a couple of days ago and brought out my knitting needles. I was really freaked that my hat wouldn't come out right but I sucked it up and did it anyway. I started to work on this "Ballard Slouch Hat" (for those of you who are familiar with Ravelry, it's done by Felicia Lo, owner of SweetGeorgia Yarns.) pattern and I was really pleased at how pretty it was starting to look. I was binding of my hat and I was really disappointed with the result. It was this bunched up mess. I wasn't able to take a picture of it, but it was terrible. You couldn't even see the cute pattern and it looked more like a beanie than a slouchy hat. I had used Red Heart Super Saver yarn so I thought that maybe it came out so bad because I didn't use the yarn the pattern called for which was a silk aran blend. The pattern said that after knitting you could soak the hat in warm water and form it. I didn't know if it would work, but I tried it anyway and I am now pleased to present my VERY FIRST (finished) knitted project! 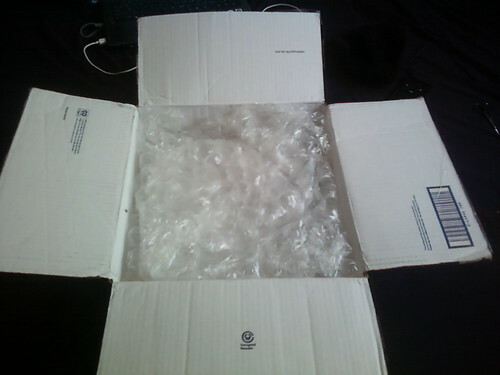 A wad of bubble wrap. Now I know almost everyone likes bubble wrap but see, I LOVE bubble wrap and the bigger the bubbles, the better and these bubbles are HUGE. So before I continued discovering my package I grabed a handful, popped, giggled my head off for a good 5 minutes! I finally pulled myself together and continued on to find my gifts wrapped in black yellow and white tissue paper along with a beautiful card. Wrapped in the paper was ‘Court Jester’ (A comedy I had never seen before), Orville Redenbacher’s popcorn (My fave brand), Swiss Miss in dark chocolate (Which I’ve never had), and this beautiful hand spun yarn in a beautiful shade of green. I love it so much! Now I’m off to go have my little movie time. I know it's been a while since I last posted about yarn-related things. I actually have a lot going on. I have a few W.I.P.s going on, I'm putting my star scarf on hold because, well, I'm just plain bored of it. I am working on my Not-so-striped cardigan, which is coming out beautifully. But what is taking me the most time, is putting together a swap package. I'm so excited because this is my first ever swap. It's supposed to be movie themed but not all of my stuff that I'm putting into the package relates to some movie. Haha. I have most of it put together but there are still a couple of things I want to add. My main problem is that I have run out of money so I have to wait until I get paid again then, I shall finish up and it shall be on its way. The person sending to me told me yesterday that her package should be going out today and that gets me so excited I feel like a little kid right before Christmas or their birthday. 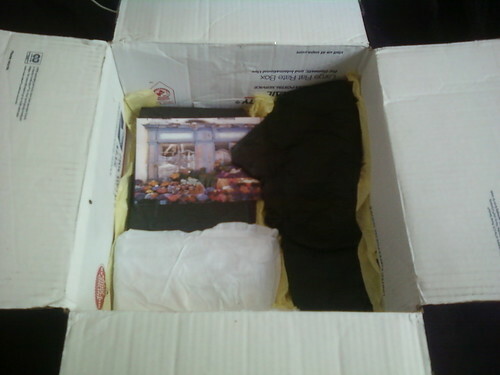 I LOVE getting mail, especially packages! 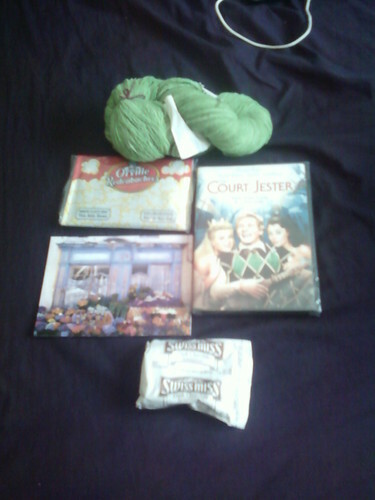 *Squeal* Okay, off to go play with more yarn! Omg. So we were driving home from Cal City when we saw....get this.....a TEXACO!!!!! I thought they all went outta business. Do we really still have Texaco's?